The AttributeID value for the following attribute duplicates the AttributeID value for the following existing attribute. 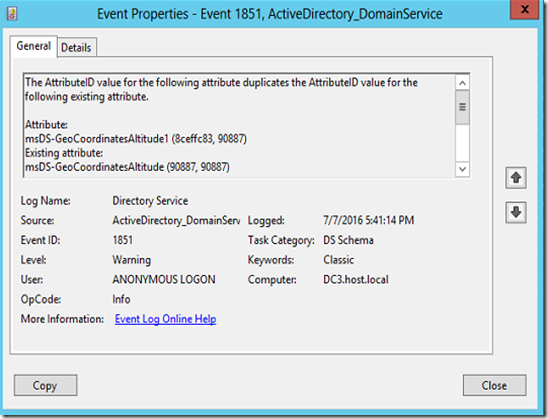 Both attributes are considered deactivated (as if the isDefunct attribute value were TRUE). 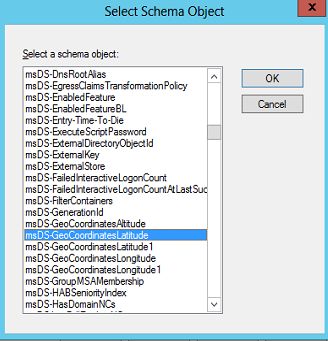 The condition will resolve itself after the schema directory partition has replicated successfully. 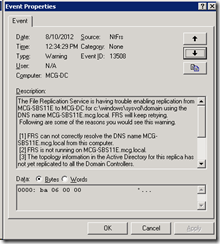 If this event continues to occur, initiate a replication cycle with all replication partners of the local directory service. If the condition persists, deactivate one of the above classes by setting the isDefunct value to TRUE. Here is what I tried to do to fix the issue. 3. 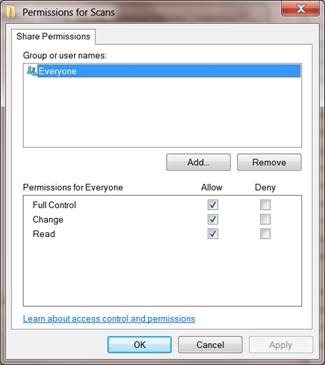 I thought, ok, so I need to take some permissions of the attribute first. 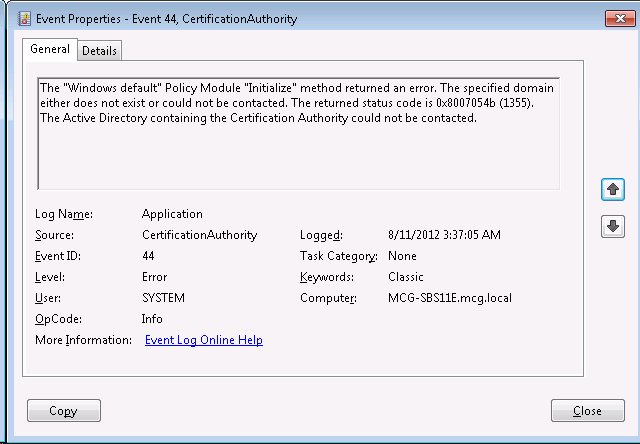 I went and took ownership of the object, but got a nasty Access is Denied error. So that solution did not work. 4. 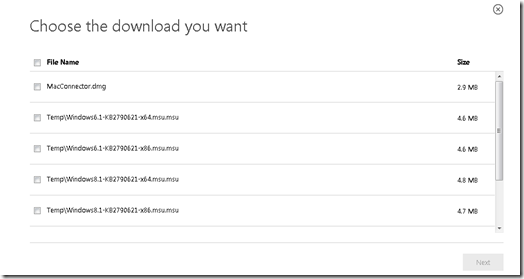 I opened up a support case with Microsoft. First we worked on the issue for over 2 weeks via online method and they were unable to resolve it. I then opened a phone call support case. We spent about 3 1/2 hours on the phone and were not able to resolve. 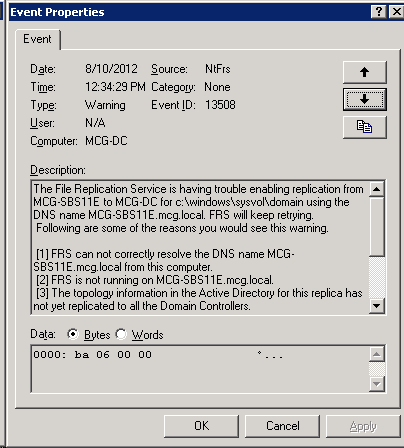 I was told, you must restore your Active Directory System state to a old backup. In this case, that was not going to fly because this object had been sitting on the server since 2013, and there was no backup prior to that date. I needed to figure out how to fix this. Here is what I did to resolve. 2. Now that I know the classes it is used in, I need to remove the attribute from the class. 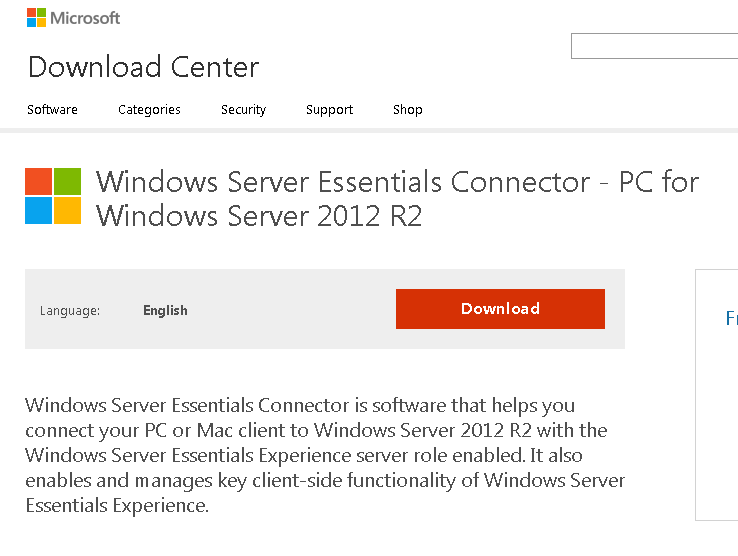 Following a completely irrelivant article from Microsoft at https://support.microsoft.com/en-us/kb/887426 I used this as my somewhat guide to help me fix this. 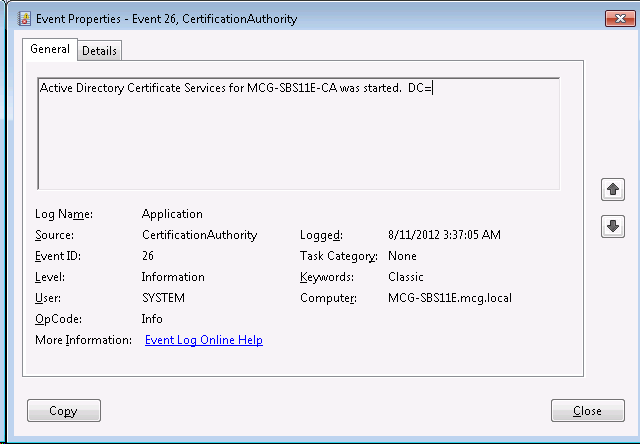 First I opened up MMC and added the Active Directory Schema. 4. 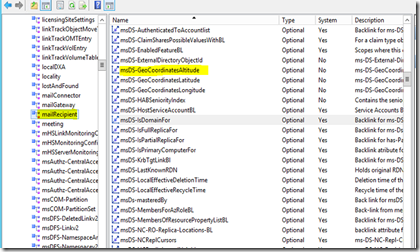 Select the Properties of it, and then go to the Attributes Tab. 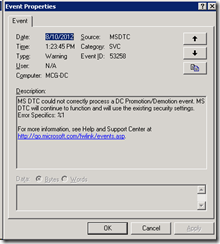 Once there, I selected in the Optional: section my attribute ms-DS-GeoCoordinates-Altitude. 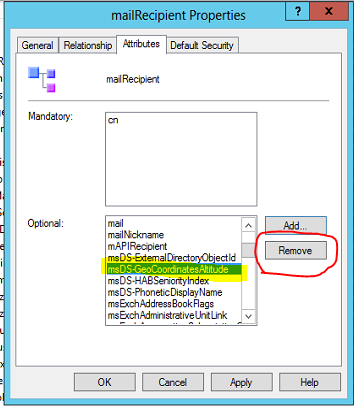 I then selected Remove. 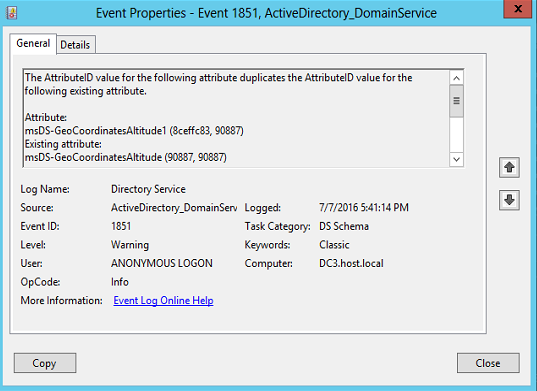 One thing to note, I did not see the BAD attribute called ms-DS-GeoCoordinates-AltitudeCNF:5975a11a-a52c-461e-ab43-3e0497314812 listed here. I am unsure why that is. 5. Now I hit OK and closed out of this. 6. 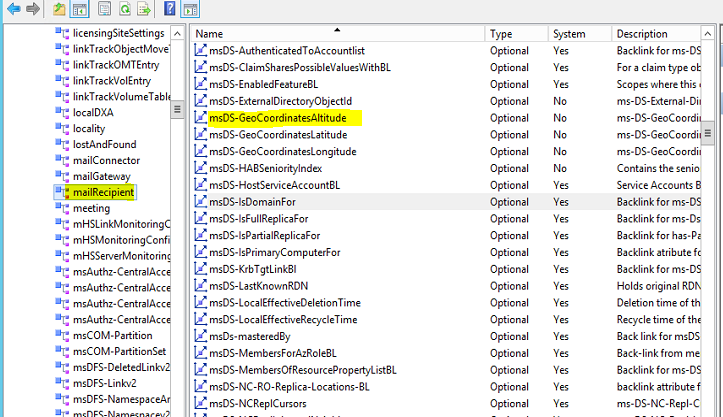 Back in ADSIEdit, I selected the attribute ms-DS-GeoCoordinates-AltitudeCNF:5975a11a-a52c-461e-ab43-3e0497314812 . I then took ownership of the attribute and applied it. 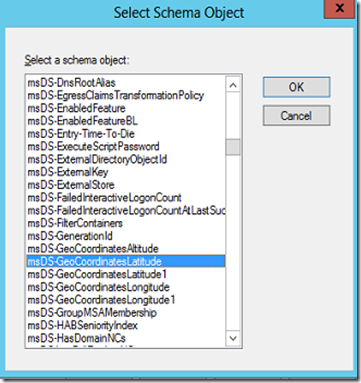 I then modified the security of the user “Schema Admins” and selected Full Control. 7. 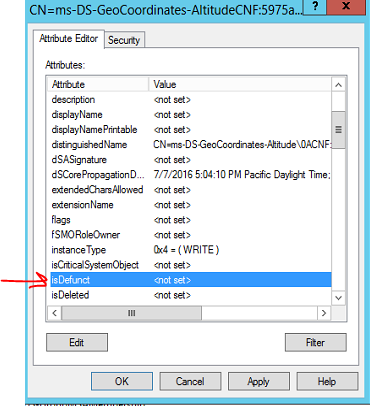 On the Attribute Editor tab, I selected the Attribute called isDefunct. I changed this from Not Set to TRUE. 9. This is a good thing. The attribute is now deactivated. The next thing to do is add the other attribute back to our class. 10. 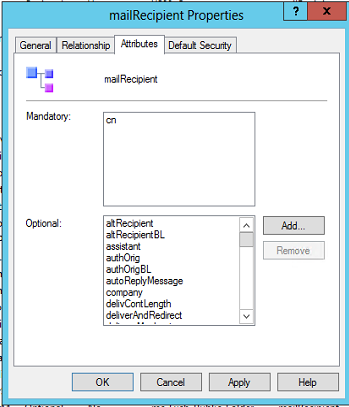 Back in our Active Directory Schema MMC, I selected my Class called MailRecipient and selected Properties. Then select the Attributes TAB. 11. 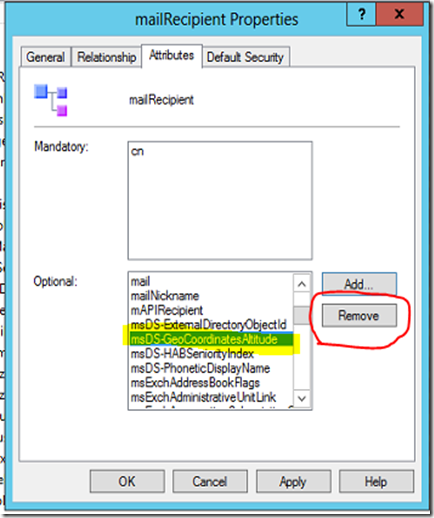 Select the Add button and find the attribute that we removed in step 4. Now add it back to the class. 12. Hit OK, and then OK again. 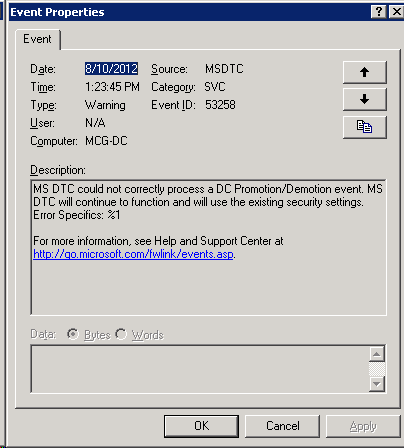 In my console, I got an error that the MMC crashed. Rather odd. I closed it down and re-opened it. 13. I verified that the attributes are now associated with the class. Here is my screenshot. 14. 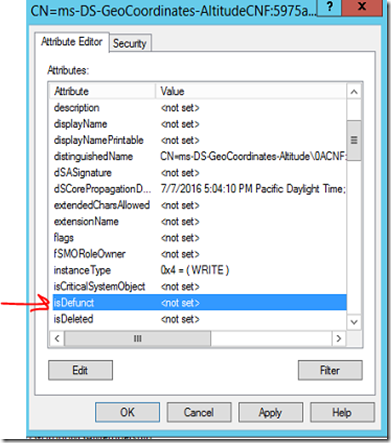 I verified in the event log that my object is now disabled. 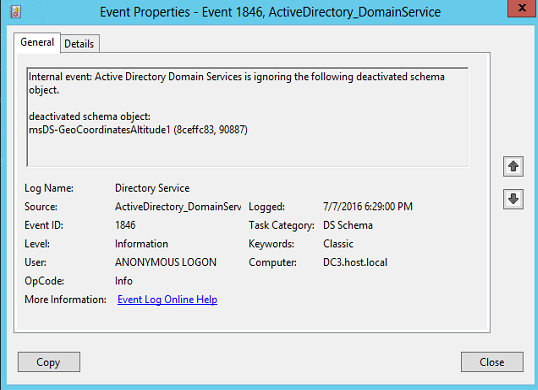 I restarted the Active Directory Domain Services Service and checked the event log to confirm it is now working. I hope this helps someone else in a bind on trying to fix this issue. After doing some research on the issue, I opened a case with Microsoft. 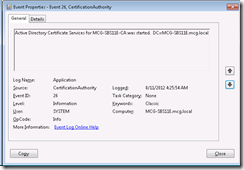 Microsoft support did some research and come to find out, it is a bug/issue that has existed since 2008. 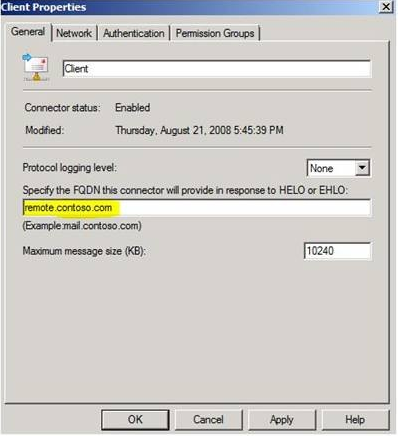 A hotfix was released for Windows 2008 and Windows 2008 R2, but it was never followed up again to be fully fixed in 2012 or 2012 R2. But don’t let that stop us, there is a solution that does fix the issue! 1. 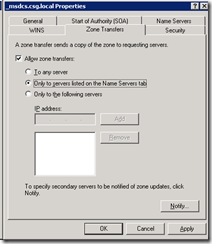 On a Windows 2008 or 2008 R2 server, install the Fax Role. 3. Install the hotfix on your Windows 2008 or 2008 R2 Server. 4. 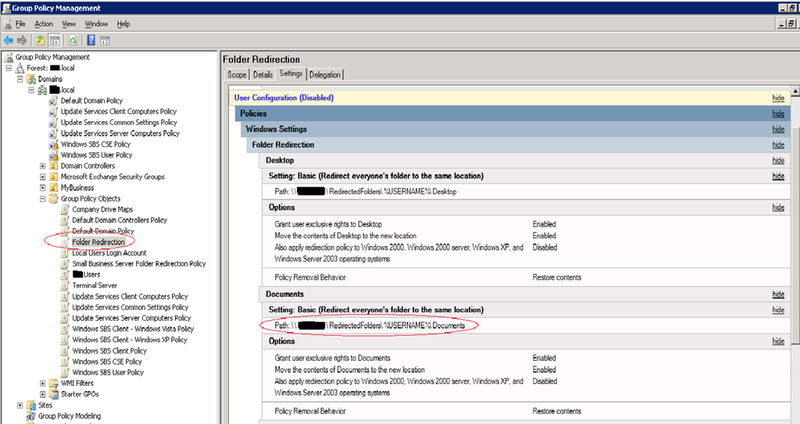 If you have not added the Fax Role on your 2012 or 2012 R2, do that now. 5. 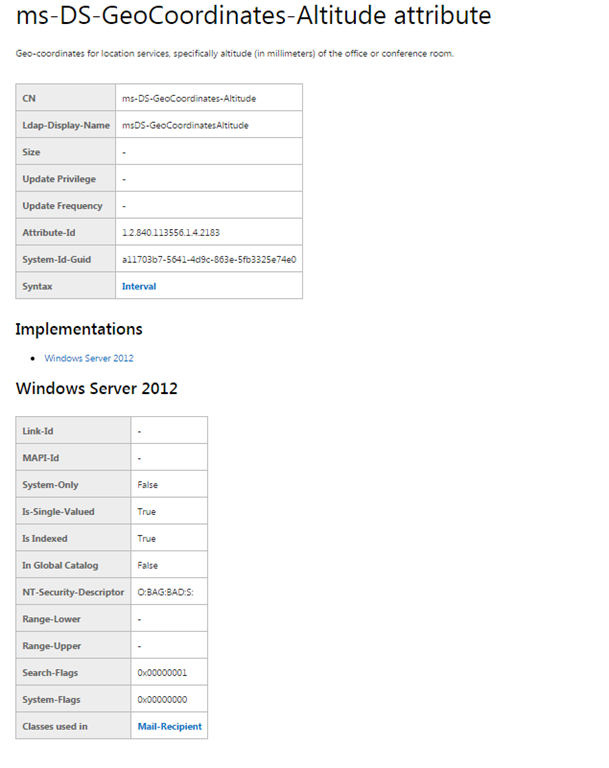 Stop the service called Fax on your Windows 2012 or 2012 R2 Server. 7. 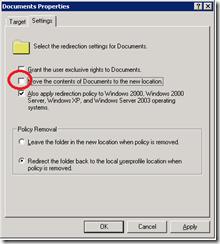 Restart the Fax service on your Windows 2012 or Windows 2012 R2 Server. You can now use the Fax service and not have it crash every time you fax! 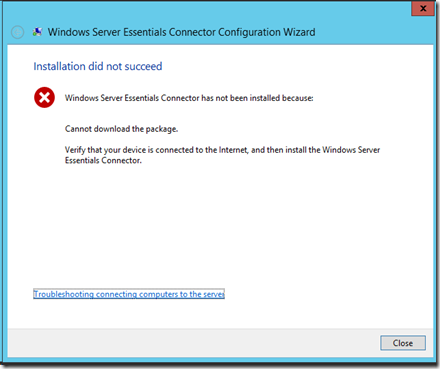 I used this product in this situation using a Windows 2012 R2 Hyper-V configuration. 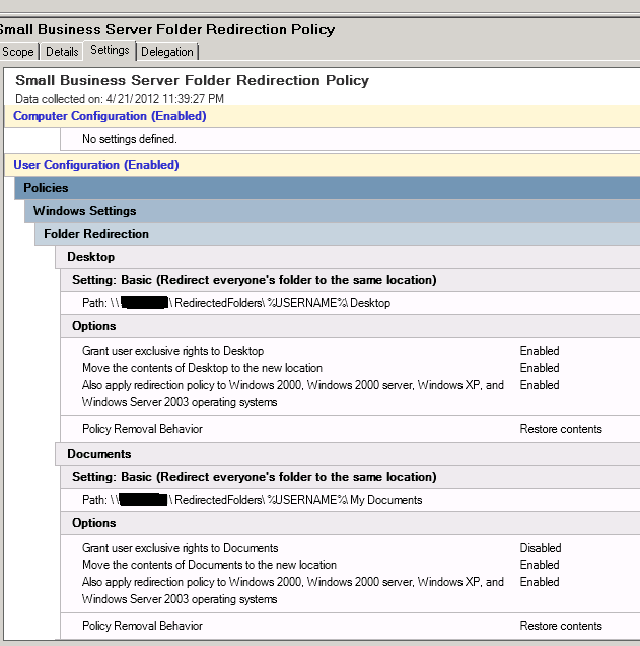 Recently I had a customer who needed us to setup the ability to scan to a SMB share. I reviewed the manual which provided basic information but after following it, I could not get the scanner to save the scanned document on the server. We contacted the copier company and the information they provided did not resolve the issue. 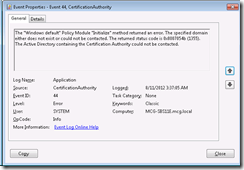 Using a packet capture tool, I was able to see why it was not working and able to resolve. I have put this post together to help others who may run into this. 1. 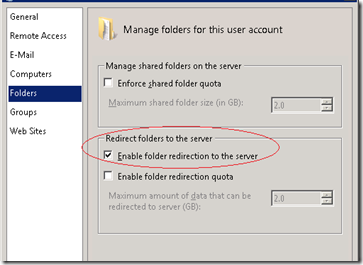 Create a folder on the server/workstation. In this case I made a folder called “Scans” off of C:\Scans. 3. 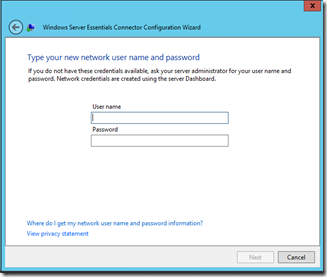 Since the Server/Workstation is on a domain, I need to create a domain account. In my case, I created a domain account called “Konicascan” and set a password for it. 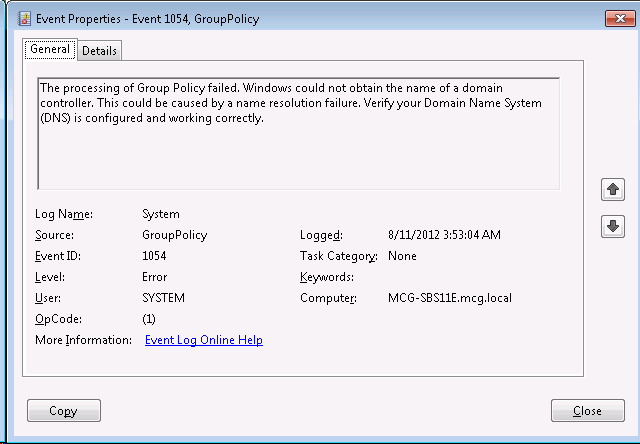 Please note that my NETBIOS domain\workgroup name in this example is “PS”. We will need that info later. 4. On the folder I created C:\Scans I set the NTFS permissions for my account “Konicascan” to have full control. 5. Now let’s program the Konica/Minolta Bizhub. 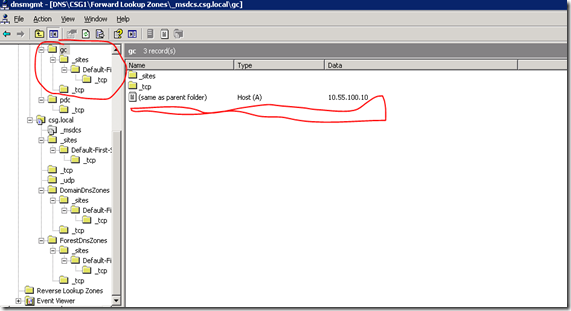 Login to the device using a web browser. 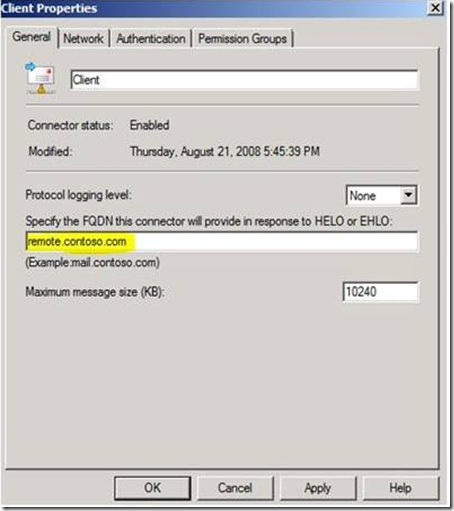 Select Login as Administrator. Please note the default password on my unit is “12345678“. 6. Now click on the Network Tab. 8. Now still under the SMB Setting, select Print Setting. 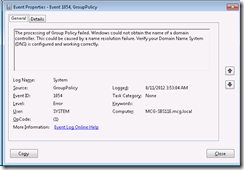 Then in the Workgroup field enter in the NETBios Domain name or the Workgroup in CAPS. 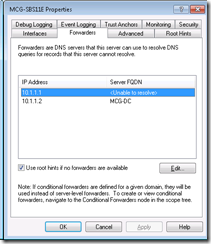 In this example my Server\Workstation is joined to a domain called PS. Then click OK.
9. Now click on the Store Address Tab. You will then be in the Address Book. The address book on the Konica/Minolta is used like a directory and settings for scanning, emailing, faxing, etc. 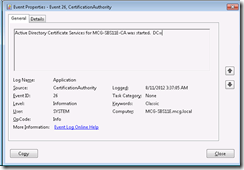 Select New Registration or edit an existing SMB registration by clicking Edit. In my case I am selecting New Registration. 10. I then select SMB and select OK.
11. Under the No. 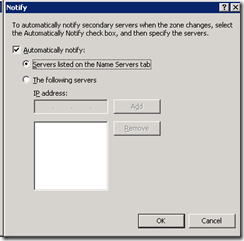 radio button I select Use opening number. You can of course select a number which is relative to where you want the icon to appear on the copier, with 1 being the first or highest number. Then in the Name field enter in a name for the Icon on the copier. 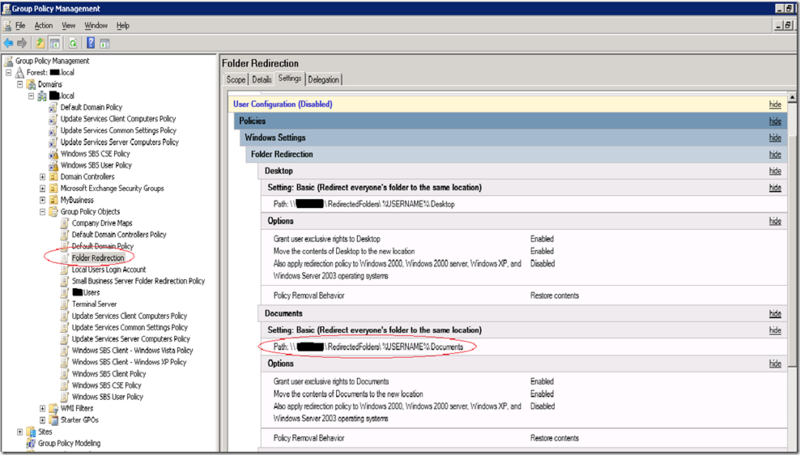 In the Index selection, I selected PQRS since my name starts with “Scan to my SMB”. I also checked the Main box. 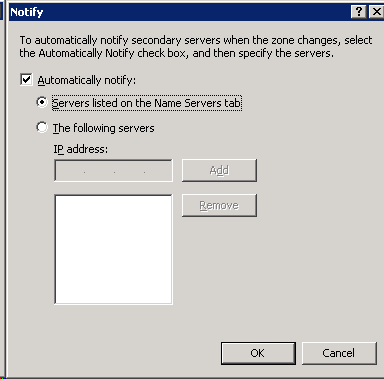 In the Destination Information, for Host Address enter in the IP address of the Server\Workstation where we crated the share at. 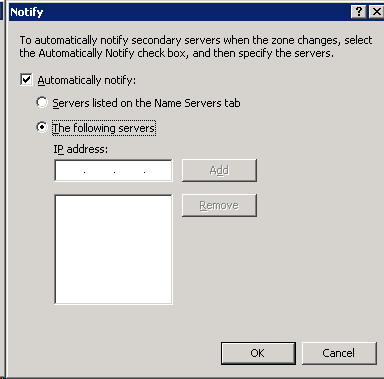 If you want to use a name instead of the IP Address, check the box, Please check to enter host name. For the File Path, I entered \SCANS since my share is called SCANS. Please note to enter this is all CAPS. 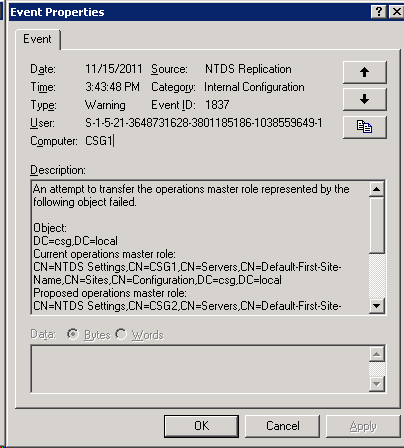 For the User ID, I entered in my domain user account I created in step 3, in this example KONICASCAN, this should also be in CAPS. 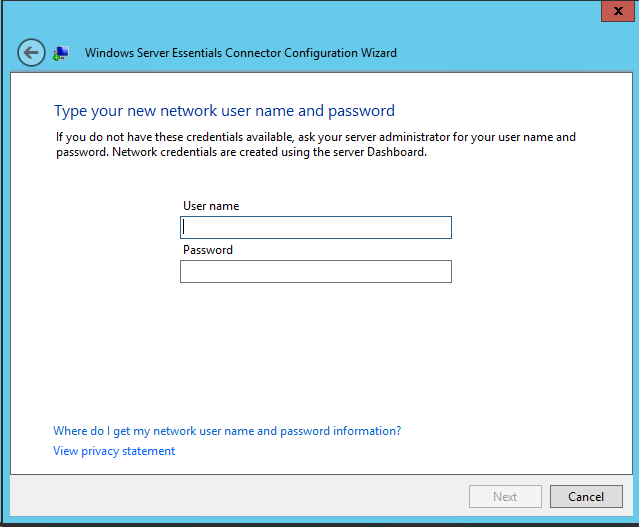 Then type in the password for the user account, and click OK. There you have it! You can now scan on the copier to your share. Important things to note. 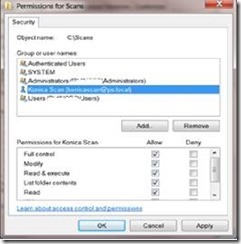 The reason we need to change the Workgroup in Print Settings is because the Konica/Minolta does not support us entering in the user name like NETBIOSNAME\UserName, or in this example PS\KONICASCAN. 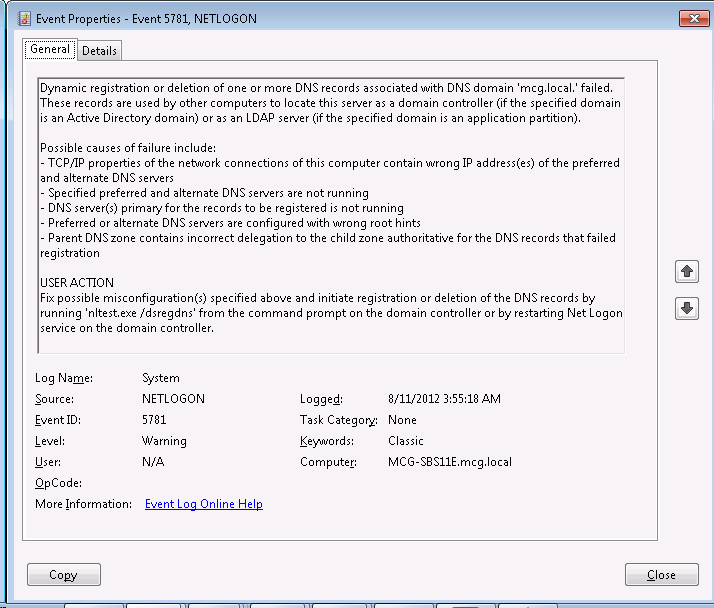 A lot of other brand copiers like Canon or Ricoh will allow you to enter in the NETBios\UserName. 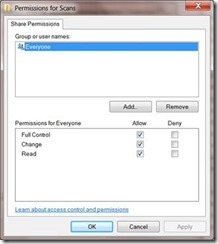 In order for it to pass authentication to the share, it appends the username with the Workgroup from the Print Settings section. This I discovered by using WireShark and capturing the packets. 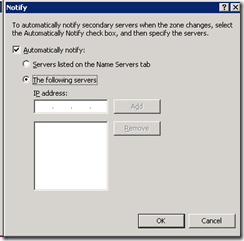 Another important thing to note is to make sure to set the NTLM settings to v1/v2 as Windows XP SP2, Vista/7 and higher use NTLM v2. Create a New Key and name it "Graphics"
Select Graphics, right-click on the right panel and create a New DWORD (32-bit) Value and name it DisableHardwareAcceleration. Once I did this, the problem was resolved. I decided to see if it was a driver causing my issue since I now had graphics acceleration disabled. I ran the Lenovo system updates 5 on the computer. It downloaded the updates and installed, but I noticed it never selected the NVidia graphics driver as well as this unit also has a Intel 4000 graphics engine on it that it never found any updates for. 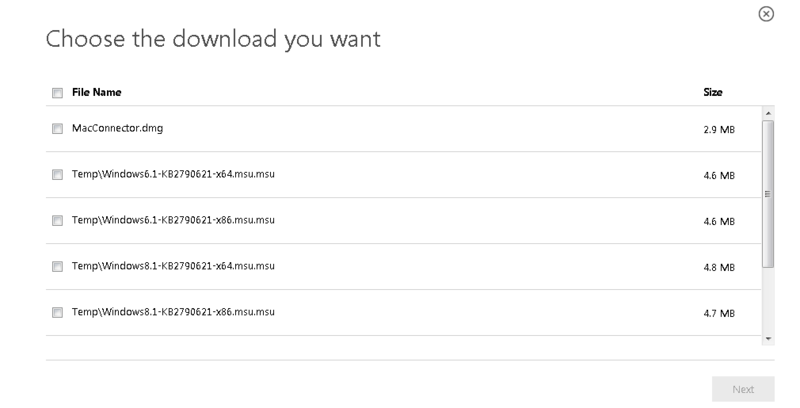 I manually downloaded these from NVidia and a customized one from Lenovo for the Intel driver. After installing and rebooting, I changed the registry key to a value of 0 so hardware acceleration is now on which is the default. 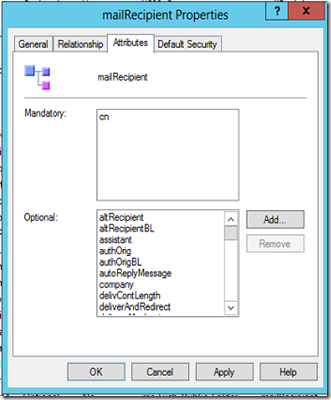 Outlook 2013 now opens correctly. If you run into an issue like this, try and update the graphics drivers, or as a last ditch effort, disable hardware acceleration. 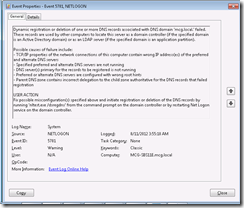 After writing up this article, I was able to find a Microsoft support KB article 2761977 which talks about a similar issue. My issue did not come up finding this article, but glad it is documented as well. 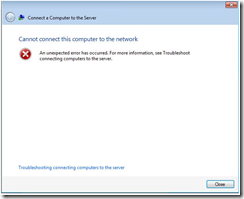 Clicking on the Troubleshooting connecting computers to the server link results in no help. 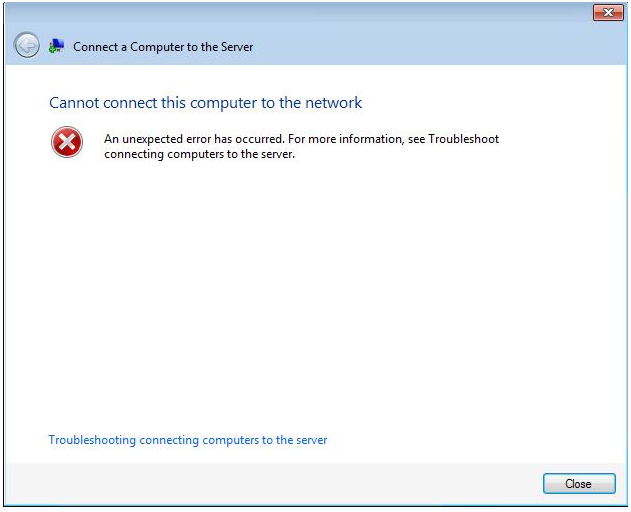 I have confirmed this happens on clients running Windows 7, Windows 7 SP1, Windows 8 and Windows 2012 R2 (Windows 8.1). So why is it happening? 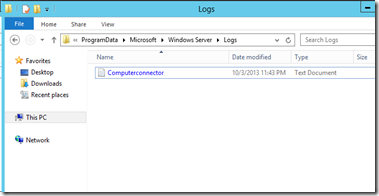 Let’s take a look at the logs. 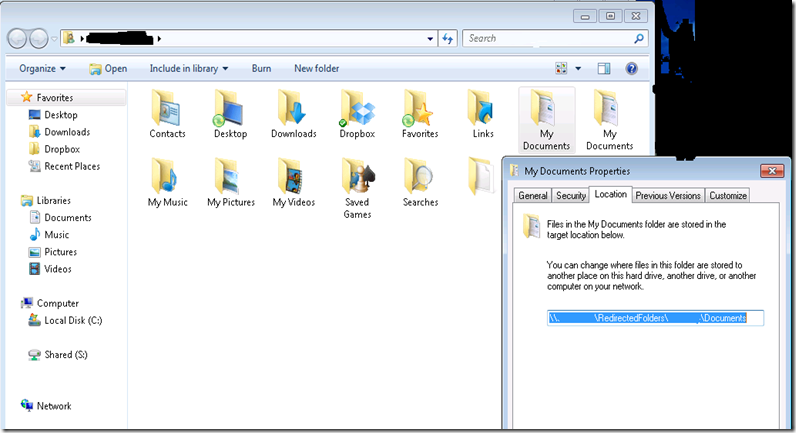 In that folder you will find a file called Computerconnector.txt . We will open this up to help us figure out why it is happening. Let’s take a look. [10/04/2013 00:10:06 8ec] NetworkUtil::DownloadFile – Create directory [C:\Windows\Temp\ClientDeploymentTempFiles] if not exist. [10/04/2013 00:10:06 8ec] _WinInetDownloadFile returns 0x80072f0d. [10/04/2013 00:10:06 8ec] NetworkUtil::DownloadFromServer:DownloadFile(https://192.168.1.4:443, Connect/default.aspx?Get=ClientCore.cab&os=Windows8.1&amd64=1, C:\Windows\Temp\ClientDeploymentTempFiles\ClientCore.cab) failed with hr = 0x80072f0d. Try http. [10/04/2013 00:10:07 8ec] _WinInetDownloadFile returns 0x8000ffff. [10/04/2013 00:10:07 8ec] NetworkUtil::DownloadFromServer:DownloadFile(http://192.168.1.4:80, Connect/default.aspx?Get=ClientCore.cab&os=Windows8.1&amd64=1, C:\Windows\Temp\ClientDeploymentTempFiles\ClientCore.cab) failed with hr = 0x8000ffff. [10/04/2013 00:10:07 8ec] NetworkUtil::DownloadFile – Create directory [C:\Windows\Temp\ClientDeploymentTempFiles] if not exist. [10/04/2013 00:10:07 8ec] NetworkUtil::DownloadFromDLC: NetworkUtil::DownloadFile(http://go.microsoft.com/fwlink/p/?LinkId=275102, C:\Windows\Temp\ClientDeploymentTempFiles\Windows8.1-KB2790621-x64.msu) failed with hr = 0x8000ffff. 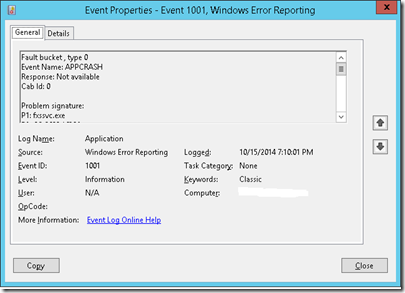 The issue is being caused from a HTTP 404 error. There are two errors here. 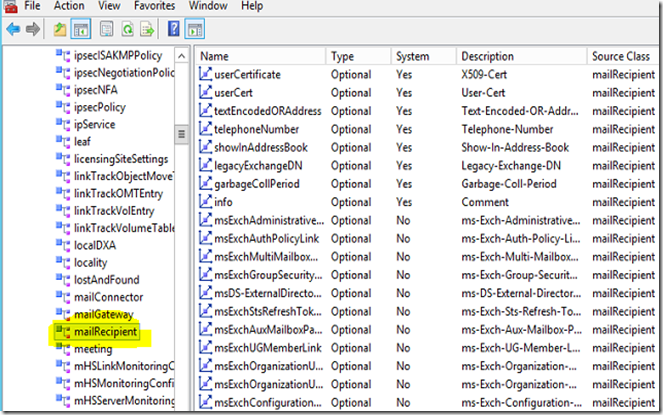 The first is it is trying to get a file ClientCore.cab from the Essentials server. Upon looking at the server, I do not find this file anywhere. Additionally, you can see it is trying download this file to C:\Windows\Temp\TempFiles\ but the file does not exist. It then moves on from this and gets the second fatal 404 error. 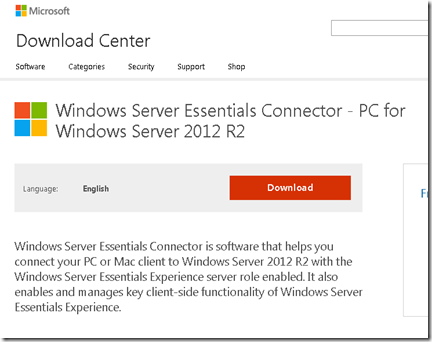 You see Essentials connect tool client needs to download an update for your operating system. 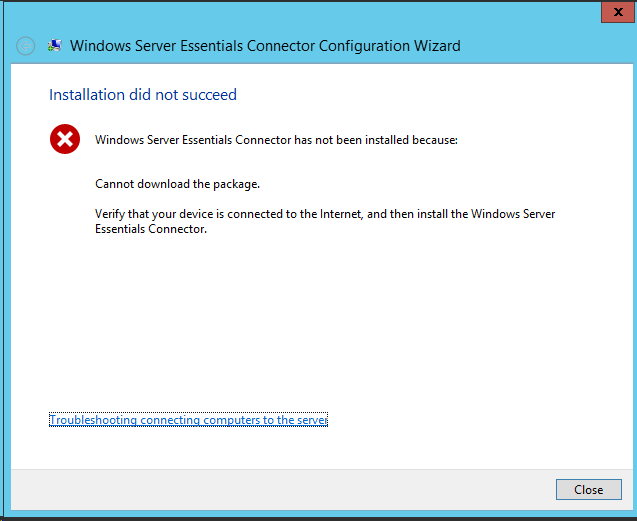 When it tries, the Microsoft server replies that the file doesn’t exist and thus we get the failure. So how do we further troubleshoot this and fix it? From here we can download the appropriate package for our operating system. If you are running Windows 7 please select either Temp\Windows6.1-KB2790621-x86.msu.msu or Temp\Windows6.1-KB2790621-x64.msu.msu depending on which version operating system x86 or x64 you are using. 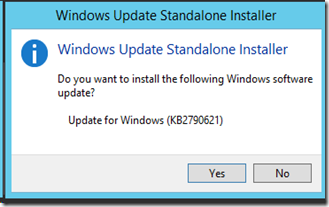 If you are running Windows 8, Windows 8.1, Windows Server 2012 or Windows Server 2012 R2 please select either Temp\Windows8.1-KB2790621-x86.msu.msu or Temp\Windows8.1-KB2790621-x64.msu.msu depending on which version operating system x86 or x64 you are using. Now that it is downloaded, run it. 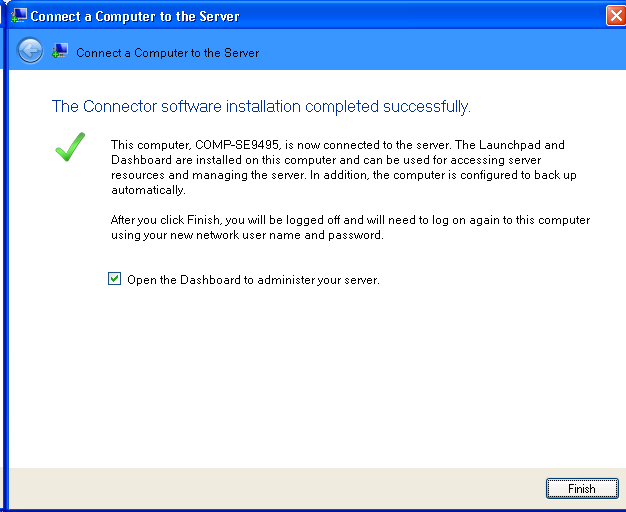 Now that it is installed, let’s run the http://server/connect tool again. As you can see, we now have success. Proceed along with the wizard to join your machines to the network. 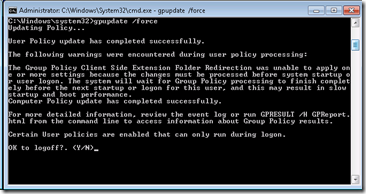 Group Policy folder redirection generates Error, The system call level is not correct. Recently I was working on a client who is setup with a SBS 2008 server and workstations running Windows 7 Professional SP1. I noticed that when a particular user would login it would take upwards of 10 minutes for the welcome screen to go away and the desktop to be displayed. 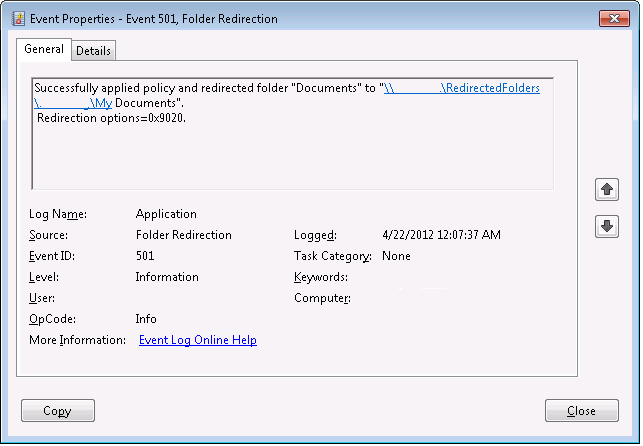 Failed to apply policy and redirect folder "Documents" to "\\SERVER\RedirectedFolders\firstlast\My Documents". The following error occurred: "Failed to copy files from "\\SERVER\RedirectedFolders\firstlast\Documents" to "\\SERVER\RedirectedFolders\firstlast\My Documents"". 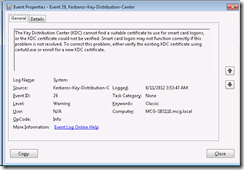 Error details: "The system call level is not correct. I did some research on this error, and came up with one valid result, which claimed that it was being caused by server quotas. 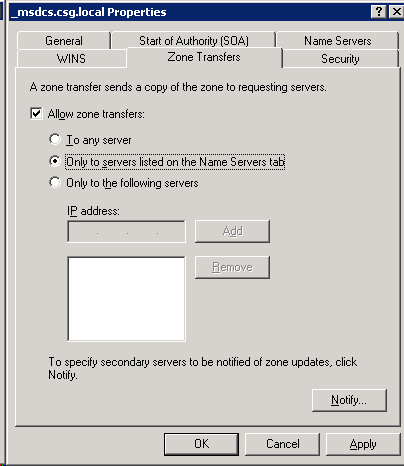 As part of the trouble shooting, I turned off quota’s on the server, however I had previously checked the users properties in the SBS 2008 console and verified Folder Redirection was enabled, but the quota’s box was unchecked. I do question why the policy was attempting to take the same server and users folder and move files from the “Documents” folder to the “My Documents” folder. 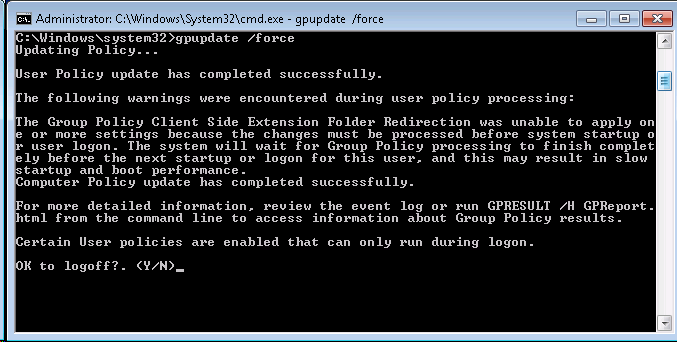 As I checked the GPO, it is set to move the files from the old location which is a default setting. Now I login as that user, and look at the event log. 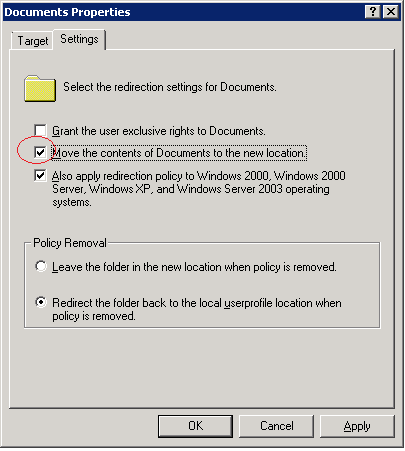 We now see success, as the policy does not need to move the existing “Documents” to “My Documents” and the policy is able to successfully apply as shown below. If you are wondering why there are two My Documents folders, the second one that is not Sync’d is actually Documents. I just deleted this folder as it is not valid. 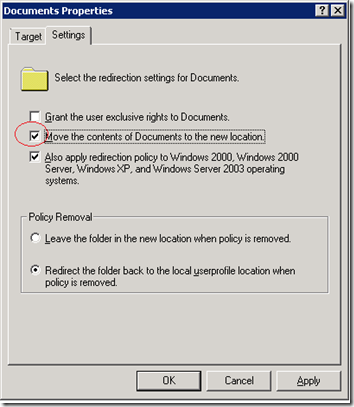 I suggest re-enabling this policy setting once the issue is resolved so that if you have a user who didn’t have this policy applying or in the SBS Console you checked the box and you now want it, that the files are moved from their default location to the server location. 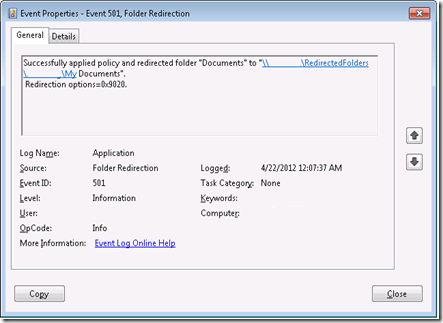 I also saw that Microsoft released a hotfix titled You encounter a long logon time after you enable the "Do not automatically make redirected folders available offline" Group Policy setting in Windows 7 or in Windows Server 2008 R2 at http://support.microsoft.com/kb/2525332 however, in this case it does not apply. 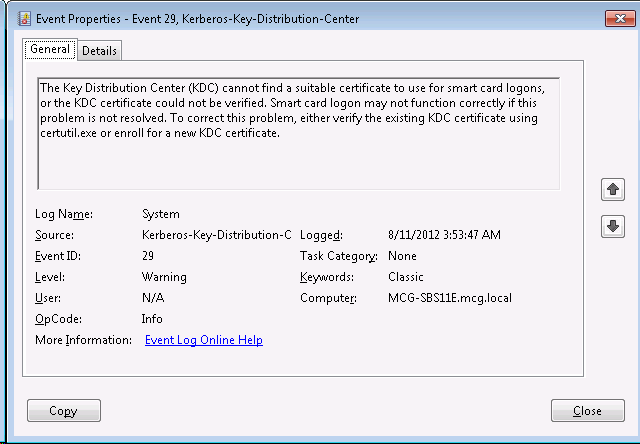 As you can see, the error The system call level is not correct is a very generic error which by just looking at it, tells you almost nothing. 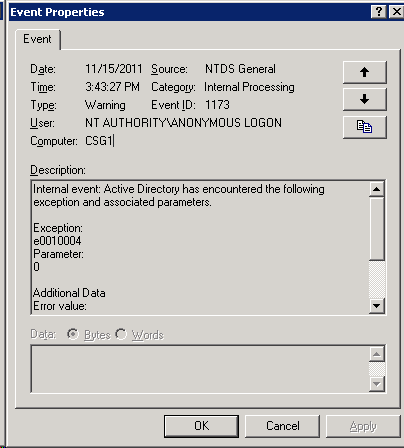 Internal event: Active Directory has encountered the following exception and associated parameters. 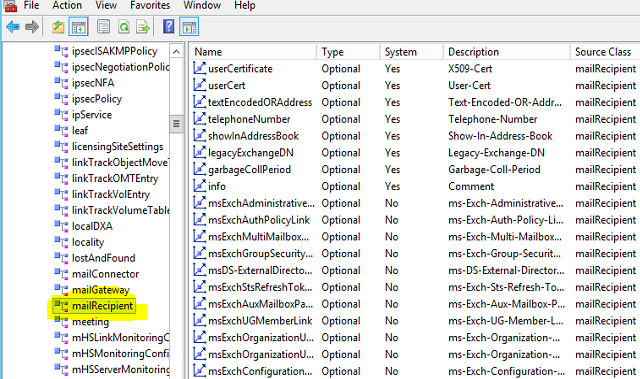 Upon doing some more research, I came across this hotfix from Microsoft http://support.microsoft.com/kb/981259 which does not specifically address Exception e0010004 but does address e0010005. 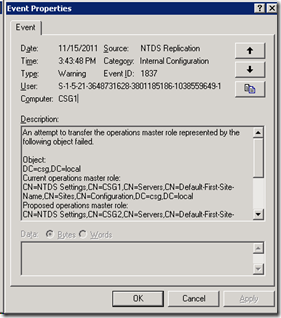 I installed this hotfix and then proceeded to manually transfer all FSMO roles using NTDSUTIL on the SBS 2011 server from it’s self to it’s self . This might sound strange, but I wanted to do this per another article I read on Microsoft’s site. Once I confirmed that all the roles transferred over from the new SBS 2011 to it’s self. I then moved the roles back to the old SBS server. 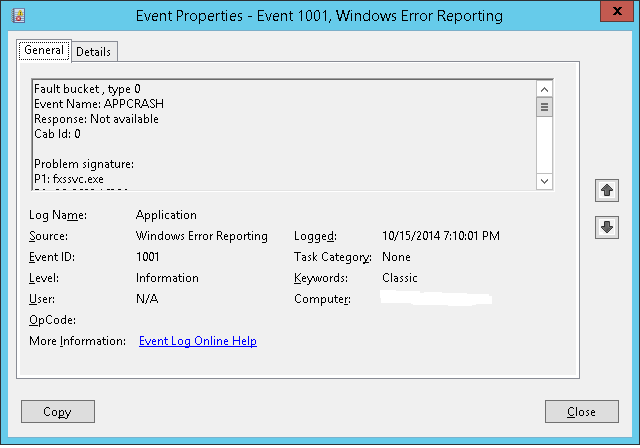 Then verifying event logs, everything looked clean and happy. I also noticed this event on the old SBS 2003 server. This seemed odd to me because look at the user….it is a a SID with no matching name. This is not normal. 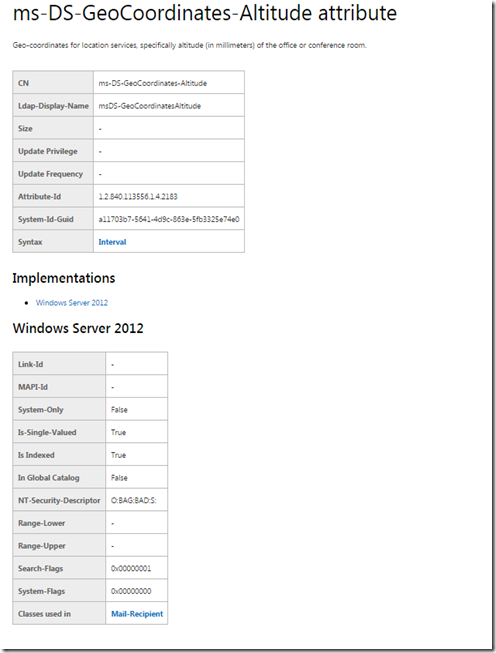 I then unpromoed the failed SBS 2011 server and removed it from the domain. 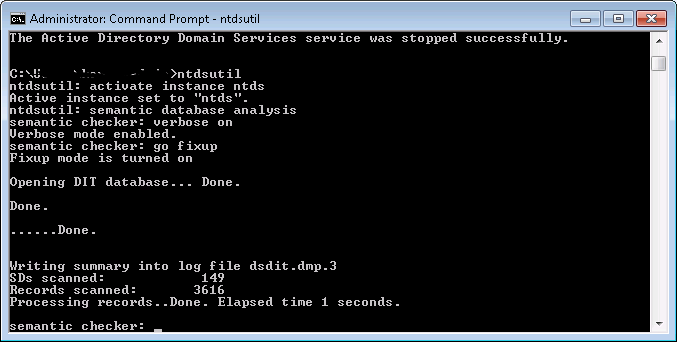 I then decided to inspect the SBS 2003 DNS server. I noticed under GC’s that there were two entries. One was the current server, in this case 10.55.100.10 and another of 10.55.100.60. Well there was no other GC with an IP of this, so that stood out like a sore thumb. 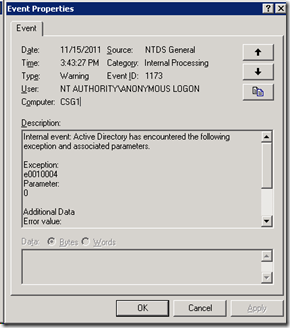 I then deleted this invalid entry and looked at all other entries, Name Servers, etc. to verify it was clean. Note Level 5 logging is extremely verbose and the values of both subkeys should be set back to the default of 0 after the problem is resolved. 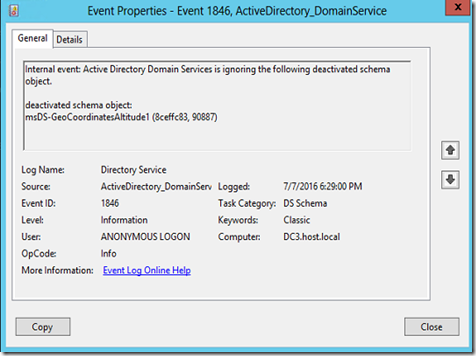 Filtering the Directory Services event log should be performed to isolate and identify these events. Make sure to also check the AD domain, in this case csg.local, as those settings were also modified. 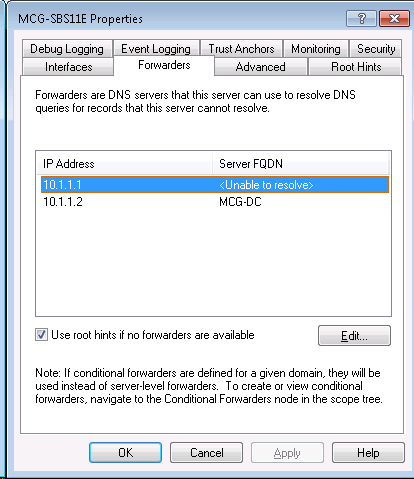 I also noticed that they had DNS forwarders on, pointing to external address’s, but when I ran the original Internet Connection Wizard on the SBS 2003 server, it made no mention of this. Weird. Ah, once I did this, I was able to migrate correctly. 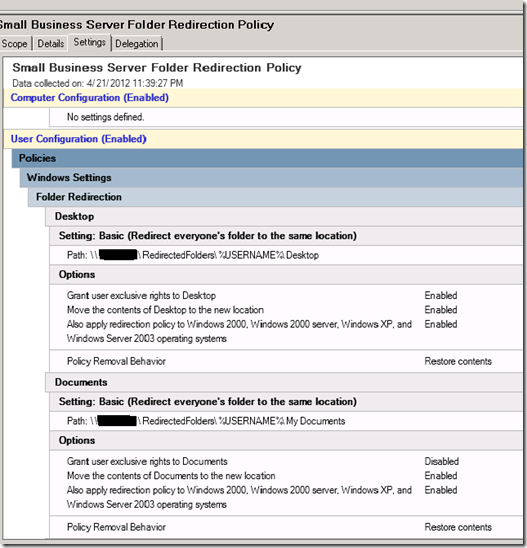 Note, make sure to cleanup the old failed SBS 2011 servers from AD, Name servers and DNS so you get a clean migration. As this was a new customer for me, I had no knowledge of the previous IT person’s skills or abilities, or how things were setup or should I say not setup correctly. Lesson learned is when you enter a situation where you don’t know what was done before, look at everything, even though it is time consuming, the troubleshooting takes even more time.